Average IT spending growth has been down 1.5 percent since 2010, and Obama’s request is coming in high in hopes of ensuring he gets at least as much in 2016. Look for Congress to appropriate less than the president’s request, but more than the ceiling allowed by the four-year-old budget law. What You Heard: IT spending will tick up to $86.4 billion this year, a 3 percent increase from 2014. What it Means: The increase pales in comparison to the 7 percent average from 2001-2009. The Obama administration says it’s due to greater technological efficiencies, National Journal reports. 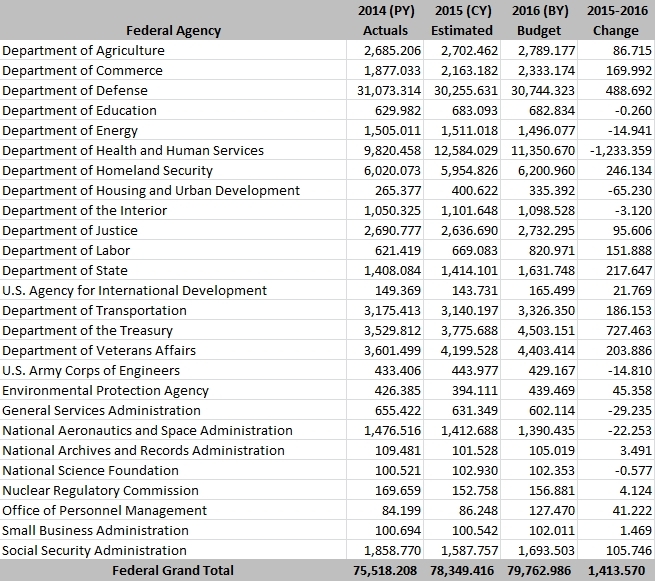 Instead of just spending more, the administration’s goal is to cut out unnecessary technology spending. That’s what’s driving programs like PortfolioStat, which former Acting Federal CIO Lisa Schlosser says has saved agencies $2.7 billion to date. The Office of Management and Budget (OMB) has been pressing agencies to use less expensive technologies to gain the same level of service, writes David Stegon atFedTech. What’s saved can then be plowed back into mission-critical needs. And not all agencies are treated equally. See the chart below. What You Heard: President Obama is asking for $105 million to expand the U.S. Digital Service (USDS) – an initiative that brings developers and tech workers into government IT. The request would support 500 USDS employees across the government and “more funding for 25 agencies to develop their own agency [-specific] digital services teams,” according to the budget. What it Means: Obama now believes the USDS, conceived a year ago, can graduate from its startup phase and roll out across government. The aim is to bring proven private sector expertise to federal IT challenges. The USDS is run by Google veteran Mikey Dickerson, who revamped the Healthcare.gov site, and is now training his eyes on the VA IT systems and others. The original USDS will help build out the new agency-specific digital service offices. The USDS will operate across every CFO Act agency except the DoD. What it Means: After recent high-profile hacks, the proposal aims to protect the privacy and security of Americans by requiring companies to comply with strict guidelines for sharing customer information, such as removing unnecessary and liable personal information used purely for advertisers. The administration also wants to increase data transparency between the private and public sectors, if a breach were to occur. Previously, a company could suffer a breach and not report it to the government. Soon it could be law. The proposals also enhance collaboration between agencies so relevant data can be shared at a faster pace. What You Heard: The request illustrates a focus on open government data as a catalyst for the private sector. It provides $16 million for E-government initiatives in GSA’s Federal Citizen Services Fund, supporting important IT investments such as open data and digital government initiatives. What it Means: A federal data-breach notification would raise awareness about the issue at companies by making it a bigger part of company policy,” said Tony Cole, VP and global government CTO with security firm FireEye. However, only 31 percent of companies surveyed by a PricewaterhouseCoopers study had a mobile security strategy and many feel that such proposals are just lip service. Cybersecurity appreciation is needed at both the executive and employee level of all corporations. Want to weigh in? Post a comment below or email me at adoggett@300brand.com.